“Expressive and performed with virtuosity - (…) an unexpectedly beautiful beginning with scraps of music wafting from somewhere and a continually spinning turntable. The show-stopper: not the sound expressions, but this clearly visible turning platform achieves all the attention for the installation by Joerg Ritzenhoff, who has been a wonderful composer of music for CocoonDance, among others, for a long time. However: This attention is not focused on the music, but on the very moment the music stops and, with a quiet crackle, starts over and over again in the last groove. An unusually impressive invention by this dance company. This stems from another time. (…) but this is also the moment in which the choreography by Rafaële Giovanola – not finally, but as feasible extrapolation – and her five dancers, seizes the power in the Ballsaal. (…). Rafaële Giovanola makes use of very expressive, extremely talented dancers, who slip in the most variable temperaments and roles, and are led by Giovanola very impressively in choral formations. So to speak, faithfully aligned to the angles. These elements are also performed with wit and very well. To avoid misperceptions, however: the “dying swan” does nowhere appear as an image in Giovanola’s choreography. The choreographer, and especially her dramaturge Rainald Endrass, love to examine formal correlations, sometimes in never-ending loops, sometimes as record, sometimes as dance – applauded everywhere. " ”The conceptional subject of repetition is transcribed very cleverly into a likewise challenging and impressively beautiful choreography. (…) But those, who were misled by the title of the piece and possibly expected another version of the dying swan, could have been disappointed. On the other hand, they were rewarded with highly aesthetic choreographic images by Rafaële Giovanola and five splendid female dancers, who fashion their roles impressively. Though the swan motive can be heard time and again in the violoncello version by Saint-Saens, it is ingeniously plucked, scratched and overlaid with noises by composer Joerg Ritzenhoff, who arranged sound and music. Likewise fragmentarily, the choreography picks up the elements of movement of the Swan-solo. (…) in RE-PLAY every repetition works like a little terpsichorean experiment that tries to make internal changes tangible in external images. Wonderful of this performance is how the motive of the swan becomes the catalyst for the choreography in order to transform this theoretical frame into feasible dance images – and thus to make it accessible. 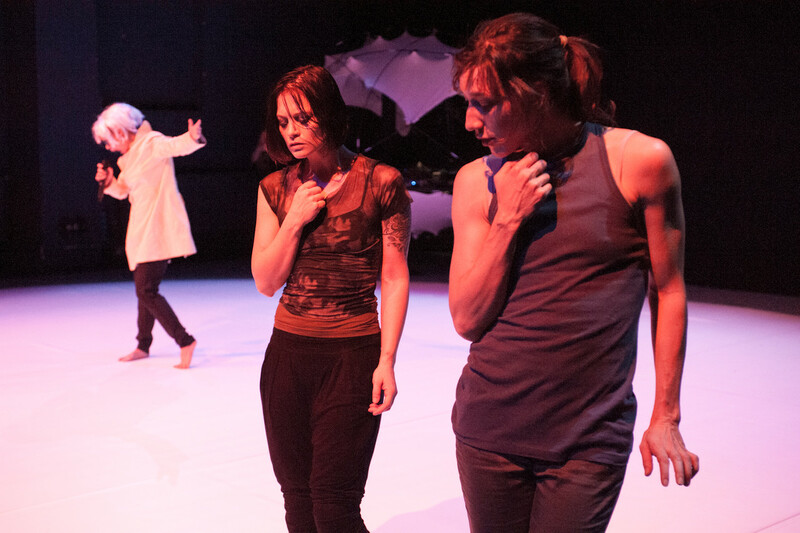 With RE-PLAY, the established production team of CocoonDance Bonn with choreographer Rafaële Giovanola and dramaturge Rainald Endrass has created a sensitive and intensive dance performance. A black-and-white video re-recording (Martin Baumgartner) projects a dancer, repeatedly duplicated as in a surrealist movie. This comes across as if her body would leave itself. In front of this black and white background, infatuating beautiful dancing images appear in warm light spots. The dancers act alone or in twos, repeat the poses of the others or move, like lost in a dream, in slow motion and slip their kimonos simultaneously from their shoulders. In this slow-down of the movements, is a morbid beauty that seems to announce an end. Accordingly, at the end of the performance, one of the female dancers lies outstretched on the floor, like at the beginning, but without her clothes, shed off except for slip and chemise. The beauty of the dancer's images is embedded in a whirring sound and warm light creation (Marc Brodeur), which combine to form a choreographic work of art. Can you repeat!" “’Can you repeat’, one of the women, who sit in radiant coloured kimonos and high plateau shoes at the edge of the stage, asks in a slightly snobbish and bored tone, while smoking a cigarette now and then. This artificially private atmosphere of the group picture seems as ritualized as the dance figures on the stage. There is neither a defined space nor a central perspective in the choreography of Rafaële Giovanola. 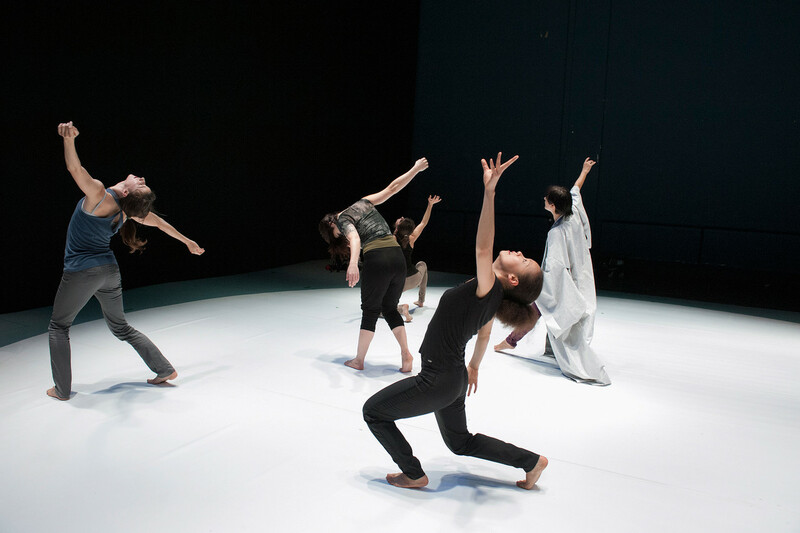 Five dancers (Katrin Banse, Fa-Hsuan Chen, Laure Dupont, Weronika Pelczynska and Imma Rubio) from five different countries vary very individually a constantly repeated vocabulary of movements. Everybody develops - barefoot in jeans and T-shirt – their personal body language and their personal temperaments. 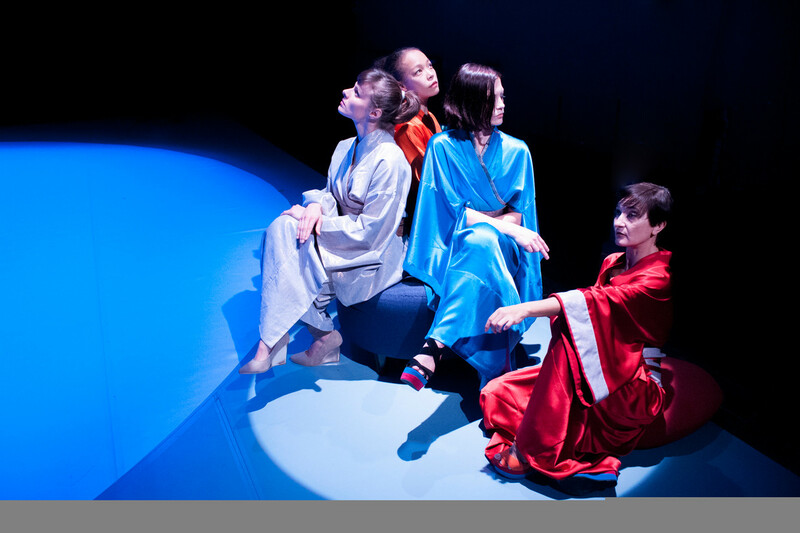 “The renowned Bonn Company CocoonDance delaminates the topic repetition with gentle humor in “Re-Play the Swan”. 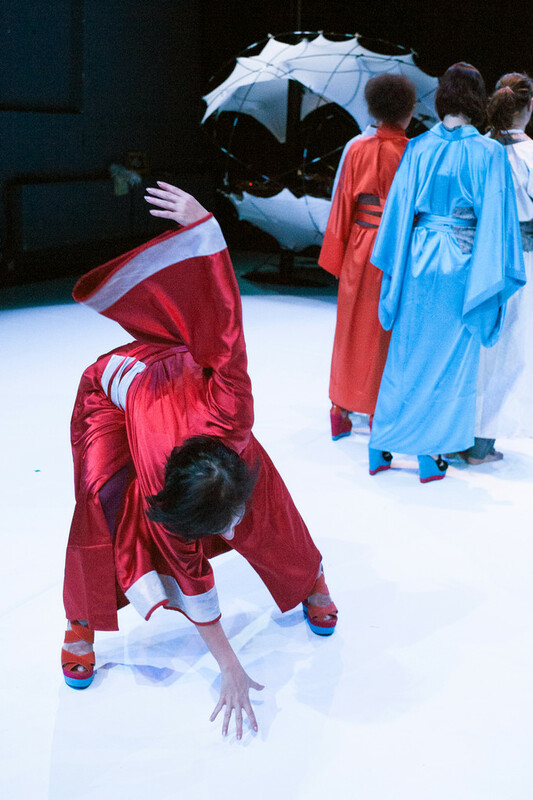 The five dancers in the Theater Ballsaal all wear the same artificial silk dressing-gowns, only in different colours, and they sit there diva-like with crossed legs and nourish their skirmishes (…). Set phrases and poses recur. This indifference, this tired keynote, renders the choreography so contemporary. In the beginning, the sound is rather unremarkable. But at some point, carried by its monotony, the noise edges its way through pauses and recordings of music right to the audience´s ear. It sounds like the rhythmic shushing noise of a record when played, moving endlessly on the turntable. Played. End. Over. 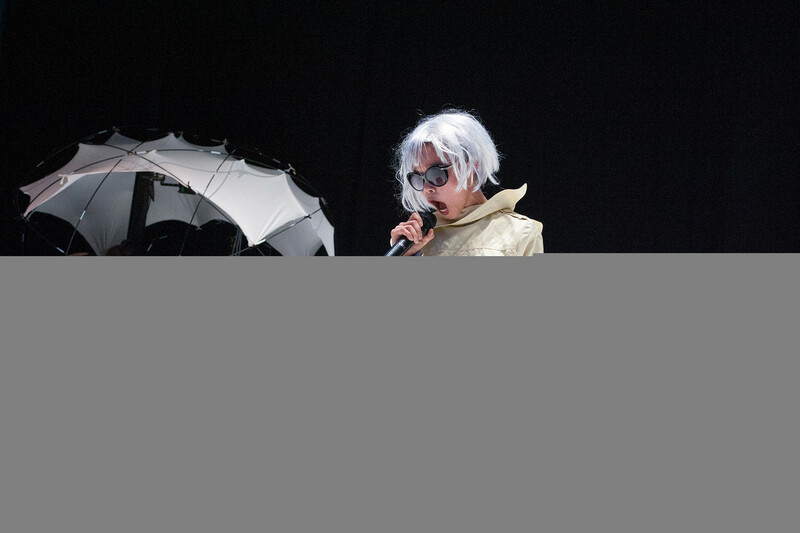 And it is even the last thing one will be hearing at the end of CocoonDance Bonn´s new dance piece “RE-PLAY. The Swan”. A small, almost marginal noise which becomes – through its poignancy – a metaphor for repetition and infinity. On Theater im Ballsaal´s (Bonn) open stage lies a casually dressed woman on the floor; four more are dressed in kimonos and sitting on an ottoman. The background holds a futuristic table covered with a canopy supported by steel strapping. On top of it: electronics, wires, amp, record player. In the course of the piece, each of the five performers will search for her sound or scratch her LP like a DJ up there. Calm, spherical music: a dancer rises, contracts her body, stretches again, one arm swinging up. The other four have a small talk with small movements of their hands; in between their recurrent “can you repeat”. They all stand up, move one place over, the second dancer starts her solo, while the first one is now standing at the sound table, participating acoustically by using several sample techniques. As if it was an everlasting rotation. Can you repeat. The dance is getting fierce. One of the dancers stretches out one leg while shaking her head, her arms spinning wildly. Is she shaking or being shook, or does she even want to shake something off? One individual eccentric sequence of movement is followed by another, when suddenly they all form a monolithic wall by turning their backs on the audience. They sway, part, come back to the ottoman – the game starts again. They live and dance through the room in numerous variations. None of the movements resembles the other. Repetition becomes the distinguishing feature. It is like an infinite search for meaning through space and time, a search for the self, which can only be formed and found in repetition, meaning: life in progress. By discussing the principle of repetition CocoonDance maintains a form of staging which is frequently used in dance. But “RE-PLAY. The Swan” does not use it because of its reinforcing visual effect; it rather establishes a symbol of constant change. This change is being illustrated in the five women´s altering movements. Each of them performs an intense solo in the center of attention. The classical motif of a swan – upper body is bent forwards, arms are stretched backwards like wings – is portrayed as being a mere sign of recognition without being of any value. Tschaikowsky´s Swan Lake motif is either being scratched or gets lost in background noise. As a matter of fact, the motif of repetition has not been used as contextual stylistic device before contemporary dance. In “RE-PLAY. The Swan” every repetition seems to be an experiment which visualizes inner change. "Dancers traverse the room, and each of them covers the stage with their pattern of movement, expressively and individually. They strike their poses again, form a body sculpture in slow motion. The group and the individual, five of them perform their impressive solos, return to the sofa, pull on their kimonos, chat, smoke. The game starts again from the beginning, just as life always starts anew and repeats itself endlessly. A touching dance experience. The memory of the dying swan by famous Anna Pavlova is integrated into this performance expertly: movements such as a jerking of the head, a floating motion of the arm, a soft waving flow, and the slow languishing on the floor, the twitching of the body. Finish.